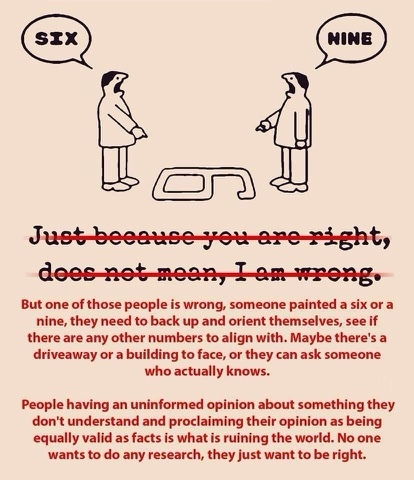 "Just because you're right, does not mean, I am wrong." In the case of is that a 9 or a 6, yes, Yes if one is right the other is wrong. That original meme drove me nuts for that very reason! One of them is right and one of them is wrong and they need to get all the info to determine who is right so they BOTH can move on knowing the truth. Ones side of the argument being correct and the other side "agreeing to disagree" solves nothing. The person who i wrong is still wrong. They learn nothing. The don't improve. They continue to make the same mistakes. All while most likely blaming the side that is correct while they do it.